Midwifery Emergencies at a Glance is a succinct, illustrated guide covering the practical skills needed to manage obstetric and midwifery emergencies, as well as high-risk midwifery care. It provides clear guidance on the factors which predispose to complications so that preventative management can be employed whenever possible. Broad-ranging yet easy-to-read, Midwifery Emergencies at a Glance details the underlying physiology and pathophysiology related to the emergency and explores both the physical and psychological care of the woman, partner and newborn during and following the emergency. 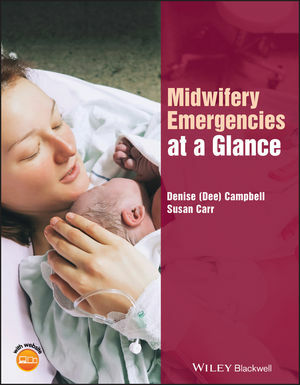 Midwifery Emergencies at a Glance is an ideal guide for practising midwives, pre‐registration student midwives, general practitioners and junior doctors to support both revision and clinical practice. Denise Campbell, Principal Midwifery Lecturer, University of Hertfordshire, UK. Susan Carr, Principal Midwifery Lecturer, University of Hertfordshire, UK.